In the first article in a series on maternal, newborn, and child health in sub-Saharan Africa, Joy Lawn and colleagues outline where and why deaths among mothers and children occur and what known interventions can be employed to prevent these deaths. Maternal and child undernutrition: global and regional exposures and health consequences. 4 million neonatal deaths: when? Where? Why? The proportion of child deaths that occurs in the neonatal period (38% in 2000) is increasing, and the Millennium Development Goal for child survival cannot be met without substantial reductions in neonatal mortality. Every year an estimated 4 million babies die in the first 4 weeks of life (the neonatal period). A similar number are stillborn, and 0.5 million mothers die from pregnancy-related causes. Three-quarters of neonatal deaths happen in the first week--the highest risk of death is on the first day of life. Almost all (99%) neonatal deaths arise in low-income and middle-income countries, yet most epidemiological and other research focuses on the 1% of deaths in rich countries. The highest numbers of neonatal deaths are in south-central Asian countries and the highest rates are generally in sub-Saharan Africa. The countries in these regions (with some exceptions) have made little progress in reducing such deaths in the past 10-15 years. Globally, the main direct causes of neonatal death are estimated to be preterm birth (28%), severe infections (26%), and asphyxia (23%). Neonatal tetanus accounts for a smaller proportion of deaths (7%), but is easily preventable. Low birthweight is an important indirect cause of death. Maternal complications in labour carry a high risk of neonatal death, and poverty is strongly associated with an increased risk. Preventing deaths in newborn babies has not been a focus of child survival or safe motherhood programmes. While we neglect these challenges, 450 newborn children die every hour, mainly from preventable causes, which is unconscionable in the 21st century. WHO analysis of causes of maternal death: a systematic review. The reduction of maternal deaths is a key international development goal. Evidence-based health policies and programmes aiming to reduce maternal deaths need reliable and valid information. 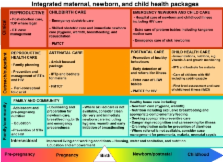 We undertook a systematic review to determine the distribution of causes of maternal deaths. We selected datasets using prespecified criteria, and recorded dataset characteristics, methodological features, and causes of maternal deaths. All analyses were restricted to datasets representative of populations. We analysed joint causes of maternal deaths from datasets reporting at least four major causes (haemorrhage, hypertensive disorders, sepsis, abortion, obstructed labour, ectopic pregnancy, embolism). We examined datasets reporting individual causes of death to investigate the heterogeneity due to methodological features and geographical region and the contribution of haemorrhage, hypertensive disorders, abortion, and sepsis as causes of maternal death at the country level. 34 datasets (35,197 maternal deaths) were included in the primary analysis. We recorded wide regional variation in the causes of maternal deaths. Haemorrhage was the leading cause of death in Africa (point estimate 33.9%, range 13.3-43.6; eight datasets, 4508 deaths) and in Asia (30.8%, 5.9-48.5; 11,16 089). In Latin America and the Caribbean, hypertensive disorders were responsible for the most deaths (25.7%, 7.9-52.4; ten, 11,777). Abortion deaths were the highest in Latin America and the Caribbean (12%), which can be as high as 30% of all deaths in some countries in this region. Deaths due to sepsis were higher in Africa (odds ratio 2.71), Asia (1.91), and Latin America and the Caribbean (2.06) than in developed countries. Haemorrhage and hypertensive disorders are major contributors to maternal deaths in developing countries. These data should inform evidence-based reproductive health-care policies and programmes at regional and national levels. Capacity-strengthening efforts to improve the quality of burden-of-disease studies will further validate future estimates. ICMJE criteria for authorship read and met: MVK KJK REB BC FN HC PMN JEL. Agree with the manuscript's results and conclusions: MVK KJK REB BC FN HC PMN JEL. Analyzed the data: MVK REB PMN JEL. Wrote the first draft of the paper: MVK JEL. Contributed to the writing of the paper: MVK KJK REB BC FN HC PMN. Responsible for data integrity: MVK. Copyright statement: Kinney et al. This is an open-access article distributed under the terms of the Creative Commons Attribution License, which permits unrestricted use, distribution, and reproduction in any medium, provided the original author and source are credited. A developmental approach to drug-induced liver injury in newborns and children. Diarrheagenic Escherichia coli in sub-Saharan Africa: status, uncertainties and necessities. A prospective study of bacteriuria and pyuria in catheter specimens from hospitalized children, Durban, South Africa.